ISLAMABAD, April 18, 2015: Freedom Network marks the first anniversary of the murderous attack on prominent journalist Hamid Mir with serious concern that findings of the three-member judicial commission established to identify his would-be assassins and the reasons for the attack have not been completed, thereby strengthening impunity against journalists and media houses in Pakistan. “It is a matter of grave concern for media that findings into the attack on Hamid Mir have not yet been made public, thereby strengthening impunity against media in Pakistan and failure to provide justice for him,” Freedom Network [FN], Pakistan’s first media watchdog organization said in a press freedom alert on the eve of the first anniversary of the attack having taken place on the journalists on April 19, 2014, in Karachi. The government of Prime Minister Nawaz Sharif had set up a three-member judicial commission on April 20, 2014 and then chief justice of Pakistan Justice Tassaduq Hussain Jilani named Justice Anwar Zaheer Jamali, Justice Ejaz Afzal and Justice Iqbal Hameedur Rahman as members of the commission on April 21. 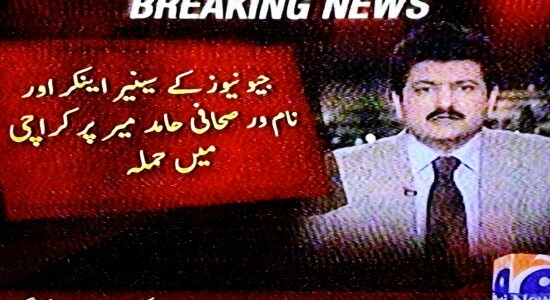 Hamid Mir, perhaps Pakistan’s most well-known journalist and famous anchor of popular current affairs show Capital Talk on Geo News TV channel, was intercepted on the main Shahrah-e-Faisal in Karachi by gunmen who pumped six bullets in his body. After a prolonged medical struggle Mir managed to survive the attack. One year after that attack, two bullets still remain lodged in his body making him perhaps the only journalist in the world practicing journalism with this condition. Hamid Mir told FN that neither the judicial Commission nor the government have informed him about the final findings nor does he know whether the Commission ever completed the report. The alert added: “This delay has only served to strengthen impunity against journalists in Pakistan as well as delaying justice to Hamid Mir, which is promised to every victim under the country’s constitution.” Over 100 journalists have been killed in Pakistan since 2000. The killers of only two have been identified and convicted but none punished. FN urged that in the interest of justice and to provide a sense of accountability and protection, the findings of the Commission should be made public and any identified perpetrators of the crime brought to justice. “Under no circumstances any facts should be kept off public record and due course of law abandoned,” FN added. An exclusive, heartfelt blog penned by Hamid Mir for Freedom Network reliving details of the attack on him and life after the assassination attempt is available on www.fnpk.org.